Let’s say you are a facility with a large IP based system with many zones. How are you going to control all of that in an easy and efficient way? Some facilities, such as large airports, have so many zones in such an expansive space that it is difficult to control the overall system and each of its components. Large facilities sometimes have thousands of pages and messages a day that need to be accessed and controlled. Director System Management software by AtlasIED can provide real time announcement activity and system status. It can display faults to isolate problems, can interact with individual zones or see the entire system. Director from our partners IED offers this and other specific features. Operators can use different priority names like “emergency” and “non-emergency” and different zone names and numbers. There can be different user accounts with unique permissions for each to manage the overall system making it easy to use. 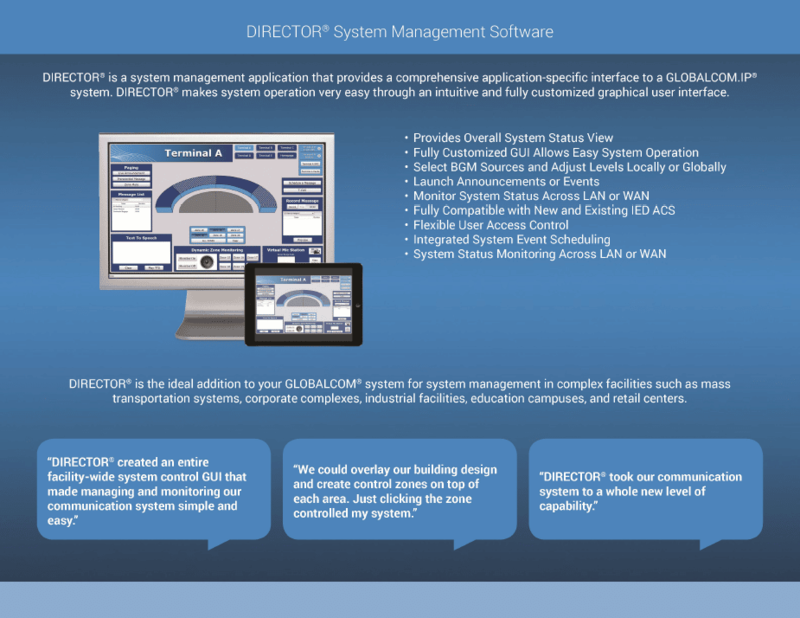 Director software can definitely start to simplify a system that is large and overwhelming.